The Hilton Garden Inn Atlanta Midtown is the newest addition to the Midtown market opening in late 2012. 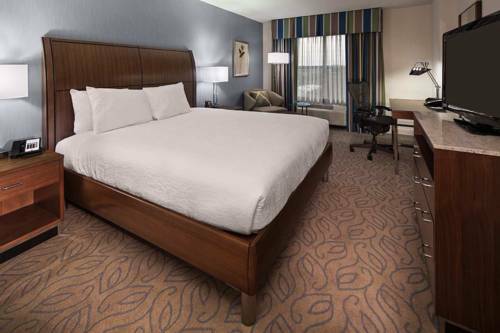 The hotel is located at the northeast corner of 10th Street and Williams Street one block from the midtown MARTA station in the heart of Midtown Atlanta with easy access to and from the Downtown Connector. Enjoy a relaxing stay in an inviting Guest Room or upgrade to a Suite with a separate living area offering a pull-out sofa bed. The hotel features -Complimentary Wireless Internet Service throughout the hotel -Full Service Restaurant and Bar serving breakfast lunch and dinner -Outdoor Elevated Pool and whirlpool -Expanded Fitness Center -Valet Parking -Adjoining 3000 square feet of meeting space -Mini Fridge Microwave and Coffee Maker in every guest room -24 hour Business Center -Remote Printing -24 hour Pavilion Pantry convenience store -12 Miles from Hartsfield-Jackson Atlanta International Airport Being in the epicenter of Atlanta Midtown there is a multitude of area businesses within a 2 mile radius. They include but are not limited to Turner Broadcasting Coca Cola Equifax Google Invesco Norfolk Southern Regions Bank Wells Fargo King - Spalding The Federal Reserve Georgia Tech Earthlink and over 20 million square feet of office space. If you are coming to visit for pleasure there are numerous local attractions you will want to see while here. Within a couple miles of the hotel you can visit Atlantic Station Georgia Tech The Woodruff Arts Center The Georgia Aquarium The World of Coca Cola and Centennial Park. Whether business or pleasure brings you to Atlanta Midtown we look forward to welcoming you soon. Reservations must be cancelled at least 24 hours in advance local time to avoid penalty. 50.00 USD early departure fee.